Hank Sullivan is a guest columnist. For questions about content, contact Mr. Sullivan. Recently an acquaintance let me know that he would not take Trump seriously until our president goes after the Federal Reserve and the too-big-to-fail banks. My answer was simple, “Okay, it’s time for you to take Trump seriously.” I said that because when our president shuts down TPP, renegotiates NAFTA, brings manufacturing industries back home, shuts down the Paris climate accord, reopens the coal mines, kickstarts the Keystone Pipeline, shakes down NATO and the Middle-Eastern countries to pay their own defense, gains agreement from the Saudis to invest in American infrastructure, repeals Dodd-Frank regulations impeding operation of our community banks, and lowers corporate and personal tax rates, Trump is going after the Federal Reserve Banks, with reckless abandon. That is because, in instituting these policies, Trump furthers a goal he has expressed many times, to lower the trade deficit. I’ll explain. When Americans purchase imported goods, dollars leave our shores for foreign shores. As a result, each of those exiting dollars amounts to one dollar less buying power for the American people. Less buying power means lower domestic demand for goods and services. Now that may be bad; but here is the kicker: To replace the $500 billion dollars leaving our shores annually, the American people must borrow those dollars, at interest, from banks of the Federal Reserve. The trade deficit is a mechanism creating demand for bank debt. That is why, over time, a substantial trade deficit impoverishes the American people, robs the US economy of liquidity, and leaves the American people and their government deeper in debt, while enriching Wall Street banks. The process I describe repeats day in and day out, bringing goods below real cost to America, creating an illusion that America is more prosperous than it is. It is an illusion because this process is really a covert instrument of plunder for the Federal Reserve banks to fleece the American people. Yes, Americans get to purchase cheap stuff from overseas; but they do so to their own demise as countrymen are put out of work and as societal debt soars to new levels each moment of every day. Seeking a balance of trade, Trump is instituting the policies I cited to help keep dollars from leaving our shores, allow Americans to retain and spend more of the dollars they earn, and attract investment dollars from overseas. These policies lower demand for imports and for borrowing to finance those purchases. In essence, the policies I outlined above work against the purposes of the Federal Reserve banks of Wall Street, and for the purposes of American people, promoting economic growth out of equity rather than debt. Until 1974, America’s balance of trade, measured in dollars, was insignificant. The dollars flowing in to purchase US exports roughly equaled the dollars flowing out to pay for foreign imports. 1974 was a most significant year because that was the year of the petrodollar agreement between the US, the Saudis, and soon afterward all OPEC countries. Since that time, nations desiring to purchase OPEC energy, which includes practically all industrialized nations, have been forced to pay using US dollars. The petrodollar system creates artificial demand for dollars all around the world. But how might countries around the world gain access to US currency to pay for energy? You guessed it; because these countries need dollars to pay for energy, they are forced take them in payment for goods they export to the US. 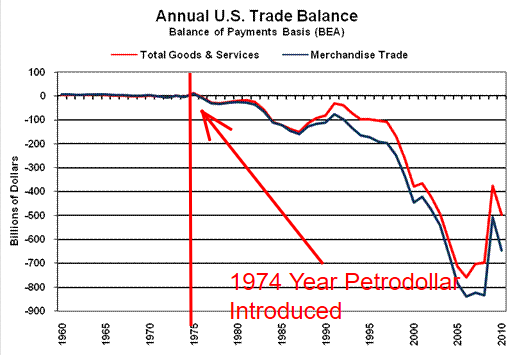 So it has been the petrodollar system all along, rather than American surplus or enterprise, that has financed the US trade deficit all these years. Producer countries have had little choice except to take US dollars, printed without cost on Federal Reserve computer screens, in exchange for their valuable products. The petrodollar system is an enforcement mechanism, compelling producer nations to take US dollars in exchange for real value, while America goes deeper in debt to Federal Reserve Banks. Now you know “the big secret” explaining America’s perceived prosperity in recent decades, while accruing an insurmountable debt. Trump knows the secret too. Initiating the policies I outlined above, he is attempting to provide America a way out, planning for a time when the petrodollar can no longer be foisted on the world’s nations. Thanks to fracking technology, oil is coming out of the ground, practically all over the world. Thus, OPEC has lost control over the world’s supply of energy. Eventually the coercive measures of the past will no longer maintain the value of the dollar as the world’s trading currency. When dollars no longer find acceptance as suitable payment for American imports, a day of reckoning will be upon us. And that is why Trump is working to restore an independent US economy, decoupling American reliance on foreign imports–including energy. If Trump is successful, America will prosper as never before. If he is unsuccessful, Americans will finally understand what it feels like to live in a third-world country, maintaining few vital industries of its own and even fewer means to import what it needs.